ed by the disaster. The Gulf Coast will be repaired and restored for the people who call it home and whose livelihoods depend on it. But, as the President said tonight, this is just the beginning -- we need to ensure that a disaster like this never happens again. The President presented a vision of a future where we as a nation are not held hostage by our dependence on fossil fuels -- and a plan for an economy that invests in energy generated right here and creates jobs for millions of Americans in the process. 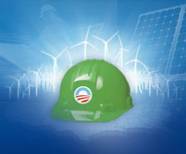 Under his leadership, some of this is beginning to take shape -- clean energy is starting to put people back to work across the country, building more efficient cars and trucks, repurposing old factories to manufacture wind turbines, and investing in research that will discover new energy technologies. Critics will say that a real transition to clean energy is a challenge that can't be met. But the President made it clear tonight that he will not back down -- even if the path forward is not easy. And, as this movement has shown time and again, neither will we. Washington has put this off for far too long -- now we must act. If you haven't already, please stand with the President for a clean-energy future. "This email came from Organizing for America, a political army that answers directly to the president. It is proof that while he is attempting to look like a leader on the Gulf oil spill, the tragedy is ultimately a political issue to him. That he would use the oil spill to generate support for job-killing cap and tax legislation and build up his email list is a rank disgrace. The president should cease this disgusting political campaign immediately and develop his leadership skills, which are clearly lacking."